Our final full day in the USA, and we had decided that it would be a good day for doing as little as possible, we were just going to look around Monterey and do lots of eating, drinking and relaxing. We started with breakfast at a local family run place on the main street through Pacific Grove. We can’t remember the name, but it was pretty average, so not much more to say really. 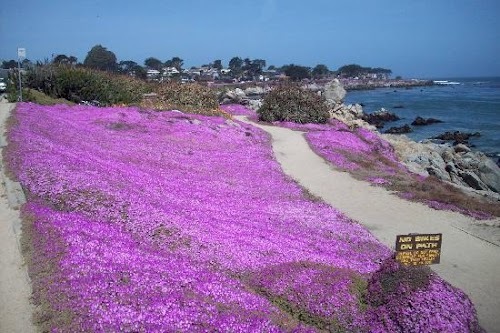 We then took the car back to the motel and decided we were going to walk along the coast down into central Monterey, if we could manage that far, so we headed through a couple of blocks of houses until we reached the coast, and turned east towards Monterrey. The weather was bright and sunny but there was a distinct chill in the air. I don’t know whether this is usual for Monterey in early September, but it was quite refreshing after weeks of scorching temperatures. The walk was quite varied, with some stretches where you are right on the sea side, and others where you cut inland a little to walk through shops and round waterfront buildings. I believe this is a part of the famous 17-mile drive. It was well paved, flat and easy going, so we just ambled along and watched the folks going by and coming the other way, everyone just doing everyday things. We eventually found the centre of Monterey by cutting inland slightly, and were fairly unimpressed. It is the centre of a moderate sized town, and has what you would expect, a few hotels, a few shops, and a few cafes. We stopped in one place which was both bookshop and café, and had a quick latte and read the local newspapers. When we left here, we immediately got caught up in a bit of a crowd milling around on the street, and we heard the sound of marching bands approaching. So we decided to stay put and see what was going on. I’m still not sure what the event was, but it had a selection of floats, marching bands, the local police and fire departments, and lots of local people dressed in a variety of costumes. I’m sure there must have been some greater purpose to the whole thing, but we weren’t aware of it – not that we really cared, it passed the time for a while. By this time, we were both getting hungry again and decided some lunch was in order. We ended up in a small bar which had outside seating and which brewed their own beer. The beer was definitely cold and wet. By the time we’d had a nibble and a couple of beers we were feeling distinctly drunk, and also distinctly relaxed. We decided to return the same way we came, except this time we a) needed more restrooms and b) kept stopping on the way for a rest. We stopped at a small beach for 10 minutes and watched the locals relaxing. We stopped in a small shop selling general novelty items and tourist tat. We searched in vain for someone selling ice creams. Eventually, we were back near home so we skipped the ice creams and crashed in the motel for a while. 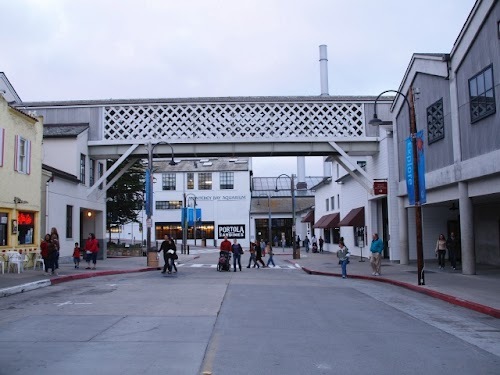 We then got up, cleaned up, and walked down into Pacific Grove for our final dinner in the US. We spent a good half hour wandering up and down the centre of Pacific Grove trying to decide on what we wanted. Kev then suggested one final Mexican to finish the holiday, and we spent another half hour or so wandering around trying to find a Mexican restaurant. Pacific Grove must be the only place we went to in the US that doesn’t have Mexican restaurants on every corner. We eventually found one, though. 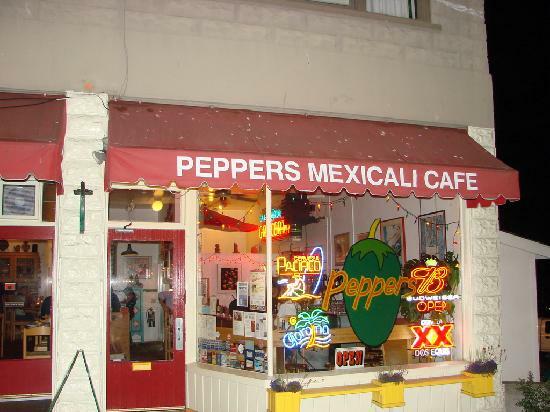 It was pretty close to, but just off Lighthouse Avenue, and so I think it must have been Peppers Mexicali Café at 170 Forest Avenue. It was an absolute gem. We had to wait a few minutes to get a table, but this didn’t stop us from getting a beer, and once we did get to sit down the food was terrific. We had lots of chips and beer and then some main courses which proved to be both substantial and very tasty. This was probably the best Mexican food we had eaten all holiday, and that is saying a lot. So all in all this was the perfect culinary experience for us and we whiled away the evening talking about all the great places we had been, and which ones we’d like to go back to some day. I think it was during this meal that we both finally were hit with the fact that the holiday was over, and all that remained was to drive back to San Francisco and fly home. This caused the expected amount of sorrow, and we felt obliged to drown the sorrow with some more beer, as you do. We made our final walk along Lighthouse Avenue up to the motel and fell into bed, having already sorted out most of what we needed to be handy for the following day.